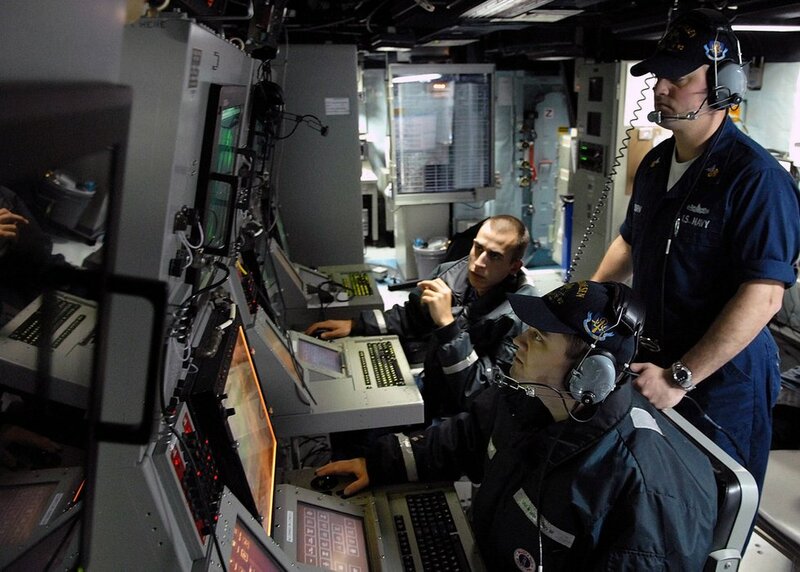 Class Mark Osborne supervises Sonar Technician (Surface) 2nd Class Randy Loewen, right, and Sonar Technician (Surface) 3rd Class Roland Stout, left, as they monitor contacts on an AN/SQQ-89V15 Surface Anti Submarine Combat System at sea. A coalition of conservation and American Indian groups sued the National Marine Fisheries Service Thursday, Jan. 26, over the use Navy’s use of sonar and other training exercises. The lawsuit was filed in U.S. District Court for the District of Northern California. It claims the National Marine Fisheries Service failed to protect thousands of whales, dolphins, porpoises, seals and sea lions from U.S. Navy warfare training exercises along the coasts of California, Oregon, and Washington. The groups filing the lawsuit include Earthjustice, the Center for Biological Diversity, Friends of the Earth, Friends of the San Juans, Natural Resources Defense Council (NRDC) and People For Puget Sound. NRDC staff attorney Zak Smith said Navy sonar and other training is harming the mammals. The lawsuit challenges National Marine Fisheries Service approval of the Navy’s training activities in its Northwest Training Range Complex. The lawsuit calls on the federal agency to mitigate anticipated harm to marine mammals and biologically critical areas within the training range that stretches from Northern California to the Canadian border. The Navy uses the Pacific Ocean off the entire West Coast for training activities, including anti-submarine warfare exercises involving tracking aircraft and sonar; surface-to-air gunnery and missile exercises; air-to-surface bombing exercises; sink exercises; and extensive testing for several new weapons systems. A spokeswoman for the Navy declined to comment, saying she had not seen the lawsuit, and the fisheries service did not immediately return an email from The Associated Press seeking comment. Smith said the lawsuit, as with previous legal challenges to the use of sonar, is not intended to prevent the training exercises. He said the initial lawsuits challenging the use of sonar by the Navy started with legal cases in Southern California. In late 2010, NMFS gave the Navy a permit for five years of expanded naval activity that will harm or “take” marine mammals and other sea life. Smith said the permit allows the Navy to conduct increased training exercises that can harm marine mammals and disrupt their migration, nursing, breeding, or feeding, primarily as a result of harassment through exposure to the use of sonar. The groups said the Navy’s mid-frequency sonar has been implicated in mass strandings of marine mammals and have caused whales to stop feeding. Newer Article: Did Twitter Just Commit Social Suicide?